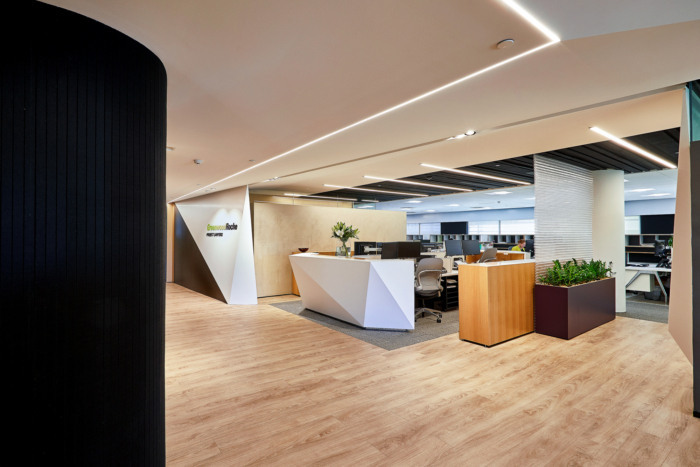 Custance was tasked with the design for law firm, Greenwood Roche, located in Wellington, New Zealand. Greenwood Roche is a medium sized legal practice with 3 offices across the main centres of New Zealand. Their new Wellington office moved from Level 9 to 13 within the building that housed their establishing offices 12 years ago. The new space was to reflect their vibrant, tight-knit office culture, while opening up the work environment and maximising waterfront views. With the addition of staff, meeting rooms and function space as well as a transition to open plan working , the illusion of space was the primary challenge. Despite a high density floor plate and low ceilings, a sense of height and volume is achieved by a holistic, 3-dimensional ‘carving’ of space. Sculptural forms frame the reception pod, opening up towards the view. Overhead, a white plane rakes upward, lifting into the black acoustic ceiling that connects all communal spaces. Solid walls and workstations are set back from the perimeter, increasing space and bringing exterior views in across the office.